In 1240, King Louis IX set his hugely ambitious plan in motion, namely to furnish his kingdom with a port town that would liberate him, with regard to future crusades, from the goodwill of foreign princes, chiefly the Holy Roman Emperor Frederick II, who reigned over Provence at the time, and King James I of Aragon, whose possessions stretched from Montpellier to Catalonia. The Constance Tower and a Château were erected in a matter of years. 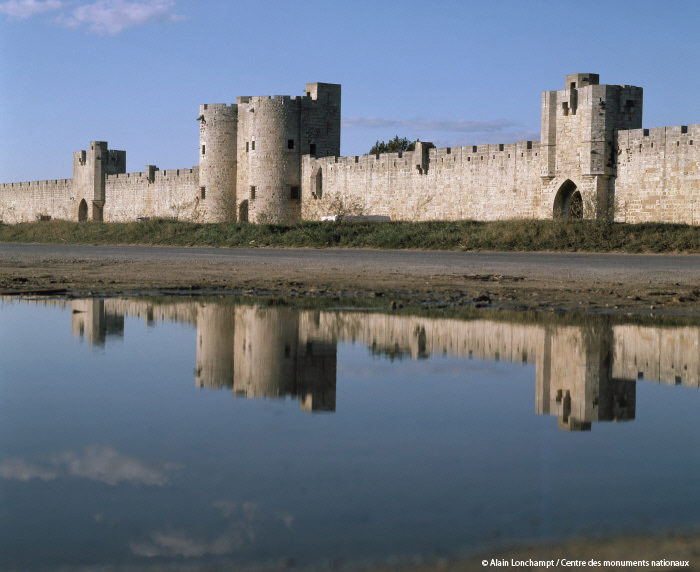 A population began to assemble in the shadow of their walls, drawn by the impressive privileges granted by the King as an incentive for the founding of the city Aigues-Mortes. In 1266, King Louis IX decided to go one better and commissioned the construction of ramparts around the town, which were not completed until some 30 years later, during the reign of his grandson, Philip the Fair. Except for the Château, destroyed during a skirmish in the Hundred Years' War and not rebuilt until the 17th century, the town has preserved the entire perimeter wall (1,643 metres), featuring three corner towers, two flanking towers and the entrances provided by five main gates and five posterns. The only elements that did not survive the monument’s reorganisation after the development of armaments are the ditches and hoarding, which were maintained until the 18th century. A port used during the last two crusades, both led by King Louis IX, Aigues-Mortes was also a commercial port from its founding – the town even obtained a monopoly for goods coming in and out of the kingdom in 1278. Although the port inevitably silted up starting in the late 13th century, it kept its monopoly until Provence was annexed to the kingdom, in 1481. Despite its gradual decline, the town continued to benefit from royal munificence. In July 1538, Francis I of France chose the town of his predecessor to host a lavish welcome to Charles V with whom he hoped to engineer a reconciliation and acquire from him the Duchy of Milan, which the French King had coveted for some time. Unfortunately, the meeting, which lasted three days, did not yield a positive outcome for the kingdom – as agreed with the Emperor, Francis I, stopped in Lyon on his way back to Paris to light stakes on which the first French Protestants were burnt. Yet these first executions did not curb the development of Protestantism, which rapidly spread across the south of France, and the region of Aigues-Mortes went on to become the theatre of numerous clashes between Catholics and Huguenots. In 1574, Aigues-Mortes fell under Protestant control. In 1576, King Henry III of France signed the Edict of Beaulieu that granted eight places de sûreté (safe havens) to the Protestants, with Aigues-Mortes at the top of the list. This provision was endorsed by King Henry IV in his famous Edict of Nantes, promulgated in 1598. The town retained its Huguenot garrison of about 2,000 men until 1622, when the town was briefly besieged by Louis XIII and Richelieu – a simple show of force to which the town's Protestant governor, Gaspard III of Coligny, Duke of Châtillon, responded by handing the town over to the King in exchange for the title of Marshal of France. 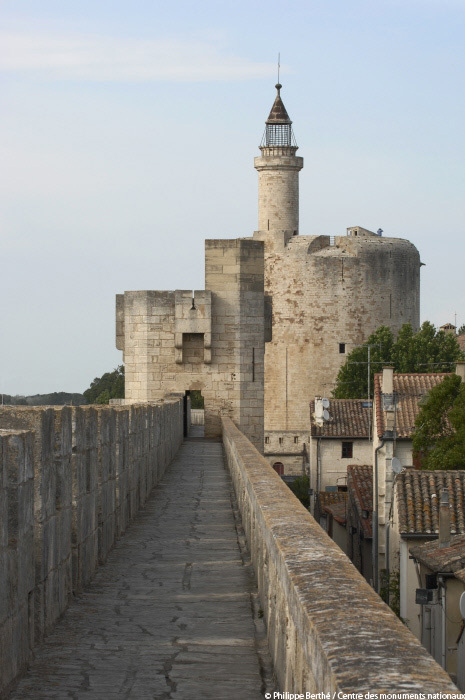 Aigues-Mortes was to become the champion of the Counter-Reformation. Throughout the 16th century, oppression against the Huguenots grew and the fatal blow fell in 1685 when King Louis XIV revoked the Edict of Nantes. Deprived of their rights, the French Protestants were forced to renounce their faith or leave the country. If they did not bend to the King's will, they were captured and incarcerated in the royal prisons. Indeed, in 1686, Aigues-Mortes became the site of one such gaol. Constance Tower, as well as the Salt, Mèche and Villeneuve towers and the Saint-Antoine and La Reine gates were modified to detain the men and women pouring in from across the region and, in some cases, used as a place of transit before the prisoners were put onto the king's ships as galley slaves or forced into marriage and deported to the colonies. Until 1768, Aigues-Mortes received hundreds and hundreds of prisoners convicted of religious heresy in its gaols. The most famous of these included the Swiss soldier Paul Ragatz, who caused trouble by singing psalms from the upper quarters that were imitated by women imprisoned in the lower quarters, forcing those in charge to fill in the oculus between the rooms; Abraham Mazel, who by some fantastic feat managed to escape from the Constance Tower in 1705 along with 16 other Camisard soldiers; and Marie Durand, imprisoned in one of the towers holding women prisoners only and who languished in gaol for 38 years before being released by the province's new governor, Charles-Juste, Prince of Beauvau, in 1768. In the 19th century, the town's commercial past was but a distant memory. Despite extensive improvements, the port was reduced to a simple inland port. However, two events took place in the 19th century that set the town's destiny along a different path – the phylloxera crisis that had been destroying France's vineyards since 1870 did not affect the sandy soil around the town and the local vin des sables experienced a boom. Over time, the salt marshes which, in the Middle Ages, had only occupied a small area of the ponds, ended up taking over most of the harbour that spanned the edge of the town. Until 1856, the salt marshes were scattered and in different hands, but then the Compagnie des Salins du Midi took ownership of them all and started a salt production business. By the late 19th century, the management was increasingly calling on foreign labour to perform the arduous task of collecting the salt, which started in mid-August. Italian migrant workers, who worked for less and were more adept to the task, were increasingly ostracised by the local population who resented them for stealing their jobs. In 1893, the management had become used to hiring foreign labour to perform the arduous task of collecting the salt, which started in mid-August. Italian migrant workers, who worked for less and were more adept to the task, were increasingly ostracised by the local population who resented them for stealing their jobs. A brawl ensued and eight Italian workers were killed, the others taking refuge in the Constance Tower. The incident caused quite a stir and diplomatic relations between France and Italy were temporarily suspended. The rise of seaside tourism, promoted during France's Second Empire (1852-1870) and especially after World War II, gave new impetus to the town in the late 19th century.